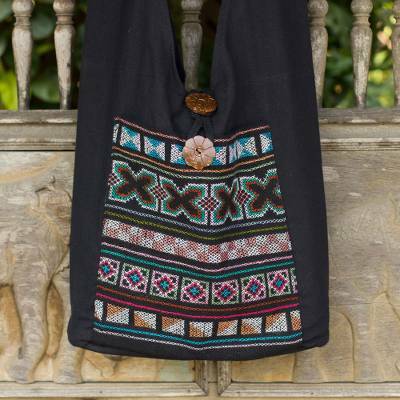 Cotton and Hemp Embroidered Sling Handbag, "Tribal Tradition"
Embroidered by hand, hill tribe motifs tell of the Akha people's rich textile traditions. The motifs cover a generous front pocket on a cotton sling tote. By Jiap Rojjana, the bag is fully lined and an inner pocket with zipper keeps small items handy. Both the outer pocket and the purse close with coconut shell buttons. Very pleased with my elephant bag. What I expected. This is a beautiful embroidered cloth purse. Strong and sturdy but LIGHT and so practical.